What is a Hot Tub Circulation Pump? Posted on September 25, 2018 September 24, 2018 , in Hot Tubs. In order to create those warm therapeutic waters you enjoy, there are a few essential components. You probably have not thought too much about how all the parts of a hot tub come together, and why would you? Hot tubs are easy to use whenever you want to enjoy a soak. But knowing some basics can help you understand how to take care of the components better, especially if a problem were to arise. In the following article, we talk about some key facts that you should know about hot tub circulation pumps. Exactly What Is a Hot Tub Circulation Pump? Circulation pumps circulate the water at a low flow rate. They are non-stop in their slow motion and continuously heat chemically treats, and filter out the water. Not all hot tubs have a circulation pump, but some have 2-speed pumps. If you do not know what model you have, look at the Amps on the label. Those under 1.5 Amps are circulation pumps. You will find many Hydropool models have Aqua-Flow Gecko Circ-Master pumps. These pumps have high-end filtration capabilities and can deliver a high gallon per minute (GPM) when compared to other models in the industry. Higher GPM allows the pump to produce better energy efficiency. Compared to other circulation pumps, this can be up to four times the filtration. You may, from time to time, experience a hot tub circulation pump problem. One way to make this easier on yourself is by knowing what to look floor. Below we have listed some common issues. Not Pumping Much – You will find an issue if you notice your circulation pump is expelling a low volume of water from the heater. Begin by removing the spa filter and see if this helps improve the flow rate. If it does not, replace the filter. If the issue is not corrected something could be restricting the flow of water or interfering with the suction. Dead Circulation Pump – If your circulation pump is not working in any way, it could be dead. To confirm this, check to make sure the power and breaker are on. Also, test that the GFCI button was not accidentally tripped. Confirm with your control panel there is no error code. This may help indicate what the issue could be. Another way to troubleshoot a dead circulation pump is by checking the valves. Make sure they are all in open position. Check for kinks in the hose and the filter. 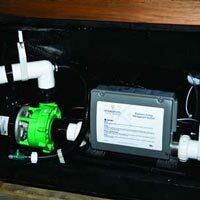 Making Noise – If you notice noises coming from your circulation pump, there is an indicative error. Red flags include humming, grinding, or gurgling. The likely issue is a clogged propeller, dirty filter, or bearings wearing down. You know what a hot tub circulation pump is and how to identify some problems associated with the component. To learn more about other essential components, download the hot tub buyer’s guide to continue.